Hours: Tuesday to Sunday from 10:00 - 20:00 hrs. Closed: every Monday, January 1 and 6, Tuesday of Carnival, May 1, December 24, 25 and 31. The ground floor of the museum, called Tecnos, is dedicated to Technology with different modules alluding to energy, transport, space, industrial production and new technologies. In it everything is possible, from piloting a powerful combat fighter and knowing what an airplane is like inside, with the F5 Northroop and the DC9; to the dizzying sensations provided by the Robocoaster, an industrial robot (articulated arm) turned into attraction that allows the user to experience a wide repertoire of movements, speeds and displacement profiles, unique and unmatched, thanks to the combination of industrial robotics and leisure; or the discovery of fascinating audiovisual techniques such as the Chroma Key, which allows us to know one of the most used techniques in film and television, generating scenes that are impossible to shoot in reality and in which, with just one layer, you can disappear or travel to the Moon. The first floor is divided into two rooms Xploratorium and Gaia, with contents of Physics, Mathematics and Biology, respectively, as well as a Planetarium, Wave Dome, Canarian cetacean area and science workshop, where various experimental activities are carried out ( didactic workshops) for children and adults in different periods of the year. Because the Canary Islands has become one of the reference places in world astronomical research for the installation of first generation observation equipment and the quality of its skies, the Paco Sánchez Planetarium, allows us to know the Universe with the Astronomy show , it is taught to recognize stars, planets and constellations seen from our sky, an experience for our senses. The second floor is the temporary exhibition hall, in this space is located the 3D cinema, which offers the viewer to enjoy the most amazing landscapes of the world without leaving Las Palmas de Gran Canaria with daily documentaries in Spanish and English as: "Pequeños Giants "and" Walking with Dinosaurs ". Being also the venue for numerous conferences and conferences throughout the year. Finally, we find in this plant, the area dedicated to the Canarian engineer Agustín de Betancourt, a room where through interactive models you can discover the work developed by this illustrious engineer. 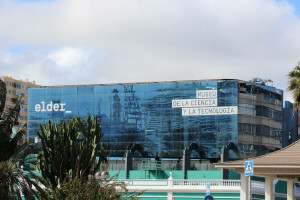 The third floor, of polyvalent use, houses the pioneering mural, a virtual walk through history and the creations of the men and women who have forged scientific knowledge, as well as the center of Canarian researchers. The library area and the dynamic programming of activities complete its use. All this set of rooms and activities show that the museum is much more than a simple exhibition center. It is a journey through human knowledge, a fun ride through the intricacies of science that is available to all and a time machine in which you can know the adventure of human progress. Do you dare to undertake the most fantastic of adventures? Horarios: de martes a domingos de 10:00-20:00 hrs.